Sunday, September 16th, 1:00-3:00 PM. 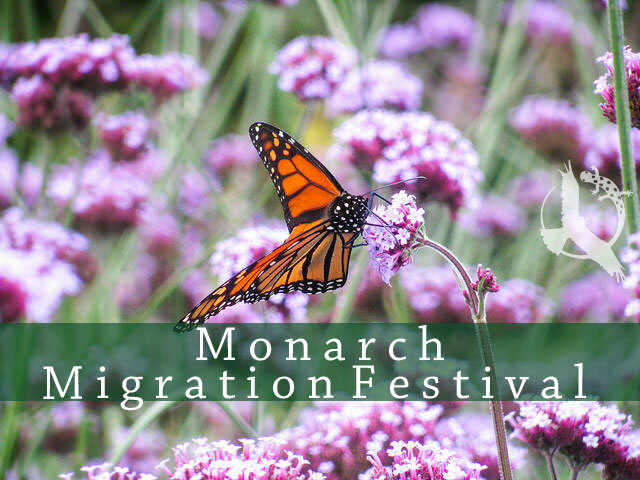 Join international conservation efforts and celebrate the incredible monarch butterfly at the Annual Monarch Migration Festival! Register ahead of time to release a tagged butterfly in LSNC's pollinator garden and sponsor the migration of additional butterflies to maximize the impact of this exciting project. Registration is required. Register for this event online, or call 734-997-1553. LSNC works to coordinate our monarch conservation efforts with Monarch Watch. We encourage you to do the same by visiting their website and taking action. What's the big deal about Monarch migration? Monarchs are important pollinators in many ecosystems from Canada to Mexico. As the adults move from plant to plant eating nectar from the flowers, they spread pollen that allows the flowers to produce seeds and fruits. These seeds and fruits are essential to the survival of other animals and plants--even humans! In the last 30 years, monarch populations have declined for several reasons. In some cases, poison chemicals (called herbicides) used to kill weeds on farms have also killed milkweed plants—the only food source for monarch caterpillars (also called larvae). When monarchs migrate south, they winter in large trees and forests. Logging and forest destruction in their wintering habitats means that there are less warm, predator-free places for monarchs to live. The destruction of food sources and habitat, along with a rise in parasites and new predators, have all contributed to the decrease of the monarch population. Monarchs living east of the Rocky Mountains winter in Mexico and then head north in the spring to lay their eggs in the Southern United States. it is the young of these butterflies that continues the migration into the Northern US and Canada to lay eggs and start another life cycle. Given the wide range of communities where monarchs find habitats and food on their journeys, conservation efforts to plant more milkweed and other pollinator plants, and to release captive-bred butterflies are happening on an international scale to try and restore the monarch population. You can join the effort at LSNC, and even plant a native pollinator garden in your own yard or neighborhood. 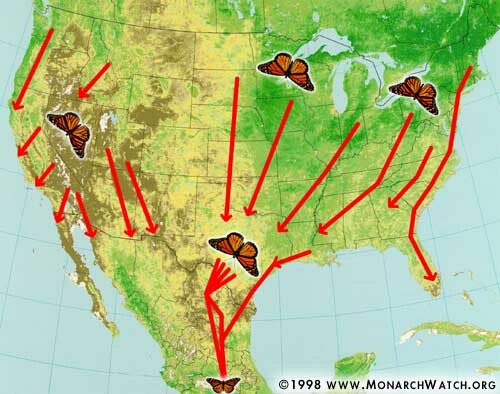 Watch the migration path of monarchs from Mexico to the north using Google Earth. Check out this clip (from Front Yard Video) of a monarch's metamorphosis as it goes from crunching milkweed as a caterpillar to forming a chrysalis to becoming a butterfly. A great way to create a deep and memorable understanding of nature's cycles is to pick places for observation. Find a few favorite spots on the Black Pond Woods Trail and visit once a month for a year. Bring a camera and notebook to document the constant activity and change. Take the same picture and compare how wonderfully different the same spot looks from the month before!